A continuation of the 2010 Art Center exhibition Close Encounters, the Hyde Park Art Center presents Signs and wonders shall appear, a new project by Maddie Leach, celebrating National Apple Month. The New Zealand artist will conclude a yearlong commissioned work focused on the apple trees of the Beaver Archipelago – a small group of islands in northern Lake Michigan. Leach shares her discovery of the island’s unique attributes by way of a specific transaction and call to interested persons. 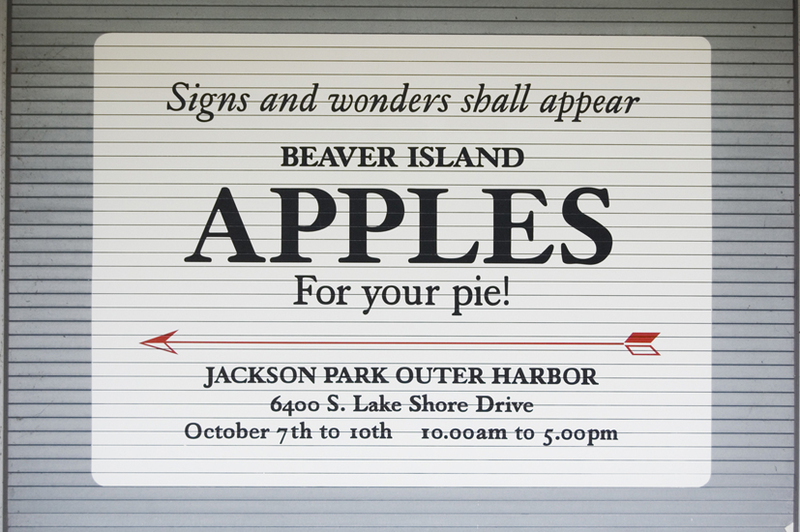 A large painted sign on the Art Center’s garage door facade will announce the arrival of apples from the island and direct passersby to a site where they can receive them. Leach explains her motivation for the project: “I was interested to discover what might be made, or produced, on Beaver Island that could be considered rare, out of reach or covetable; what might elicit or contain particular conceptual qualities of ‘the island’ or of ‘islandness’? And in turn, what could be transported, delivered to, or exchanged with Chicago – and what might these communities have exchanged in the past?” The remote Beaver Archipelago has about 600 year-round inhabitants and a peculiar abundance of apple trees that form part of the legacy of the religious communities who retreated there in the 19th and 20th centuries. In her work Leach often relies on the viewer becoming a participant in order to complete the piece. She primarily creates site-responsive, long-term projects that are conceptually driven and investigate new thinking on art, sociality and place-based art practice. Leach’s earlier work such as The Ice Rink and The Lilac Ship (2002-04) and Take Me Down To Your Dance Floor (2004) involved installing a functioning ice rink and a dance floor in public art galleries. Close Encounters is an experimental commissioning project initiated by the Hyde Park Art Center and curated by Chuck Thurow and Bruce E. Phillips. It provided eight leading New Zealand and U.S. artists with a series of shared experiences related to the nature of community in a variety of Chicago settings in May 2008. Part I featured works by Daniel du Bern (NZ), Tania Bruguera (US), Juan Angel Chávez (US), Walter Hood (US), Truman Lowe (US), and Wayne Youle (NZ) exhibited at the Hyde Park Art Center from November 2009 until January 2010. The last commission in the series will be a major video work by Lisa Reihana (NZ) in 2011. Maddie Leach received a MFA in sculpture from the University of Canterbury, Christchurch and has lived and worked in Wellington since 1995. Her research practice is largely project-based, site responsive and conceptually driven. She explores objects, space, audience spectatorship and ideas of participation in relation to art works. Solo projects such as The Ice Rink and The Lilac ShipTake Me Down to Your Dance Floor (2004) and My Blue Peninsula (2006-2007) have accompanying publications and propose questions about the role of the public art gallery – and the artist – within the broader leisure/culture industry. She has also developed a series of projects that focus on issues of trade, transportation and value for timber where she has capitalised on the ambient conditions of gallery space to dry stacks of unprocessed lumber and subsequently held online auctions on Trade Me and attempted to freight New Zealand-grown Eucalyptus logs to Chile. Her work has been commissioned for Close Encounters (Hyde Park Art Center, Chicago, 2010), One Day Sculpture (2008), the New Zealand publication Speculation for the Venice Biennale 2007, Trans Versa (The South Project, Chile, 2006) and included in the group exhibitions Primary Products (Adam Art Gallery, 2007), High Tide: new currents in art from Australia and New Zealand (Poland & Lithuania, 2006), and Linked: connectivity and exchange (Govett-Brewster Art Gallery, 2005). 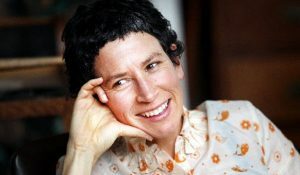 She held an International Artist Residency at the National Sculpture Factory in Cork City, Ireland in 2008 and will be the 2011 Taranaki Artist in Residence – an initiative of the Govett-Brewster Art Gallery, Creative New Zealand and the Western Institute of Technology, New Plymouth.